You know those projects that seem like they will be great ideas and you’re excited to try to create them? 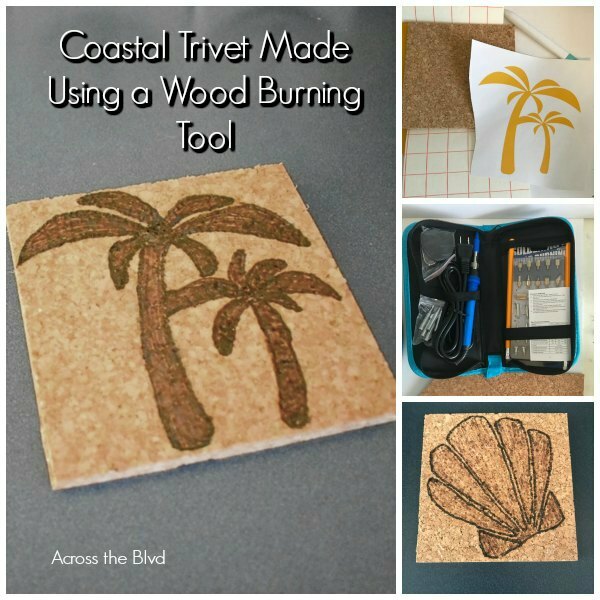 That’s how I felt about making a coastal cork trivet using a wood burning tool. However, once I got started, I soon realized that this project was more difficult than I thought it would be. I’ve got a few tips to share that I hope will give you a few pointers if you’re trying out a wood burning tool. Welcome to the January Pinterest Challenge Blog Hop, hosted by My Pinterventures. We had tons of fun participating in this challenge throughout 2018 and we’re looking forward to it again this year. The purpose of this Pinterest Challenge is to motivate all the participants of this hop (and you too) to not just pin, but to make it happen! This month, my Pinspiration is from Amanda at Domestically Creative. 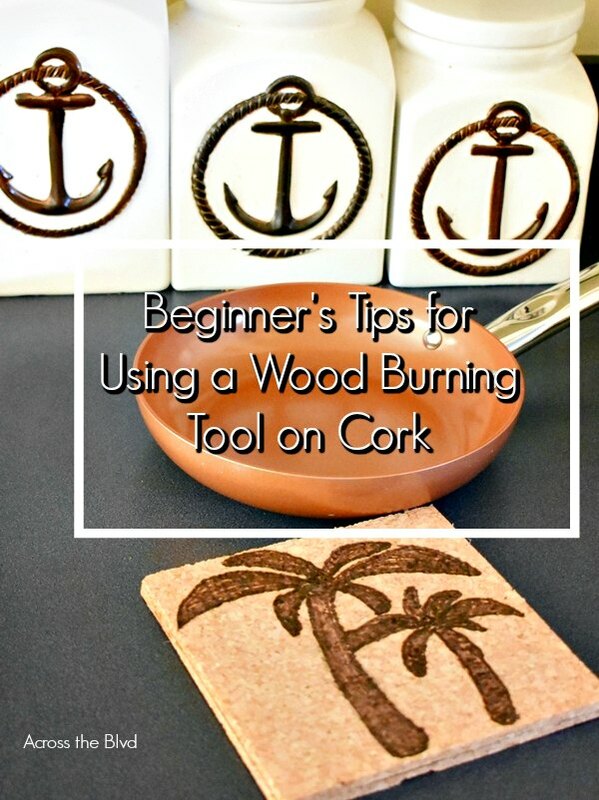 I searched Pinterest for Wood Burning on Cork and lots of ideas came up. Amanda’s Custom Cork Trivets caught my attention. She created a set of them that are fabulous! Last year for my birthday in August, one of the gifts I received was a wood burning kit. 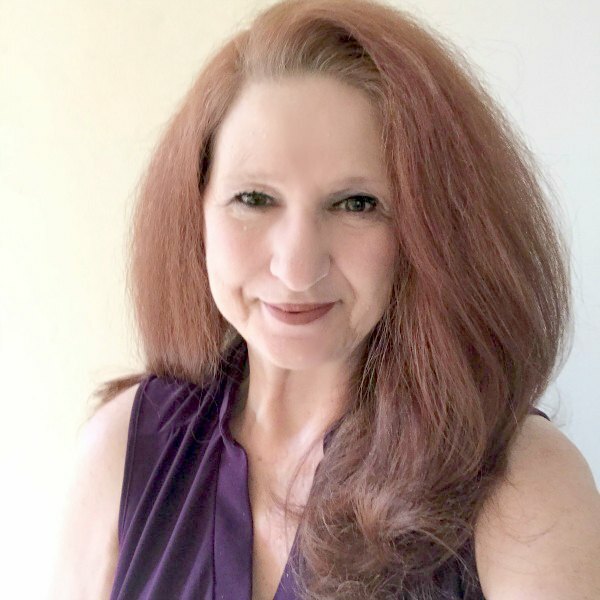 I thought it would be fun to work with, but just about the time I was ready to learn to use it, it was time for creating holiday posts and I didn’t find the time to get familiar with the tool. 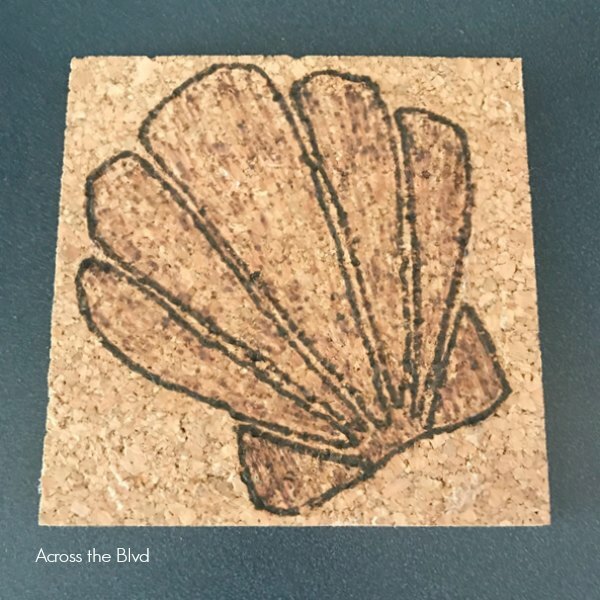 I was determined that once January rolled around, one of the first projects I wanted to do was to create something with the wood burning tool. I bought a set of three cork pads at Goodwill sometime last year. As with many of my Goodwill purchases I wasn’t sure what I would use them for, but they were cheap and I knew I could use them for something crafty. 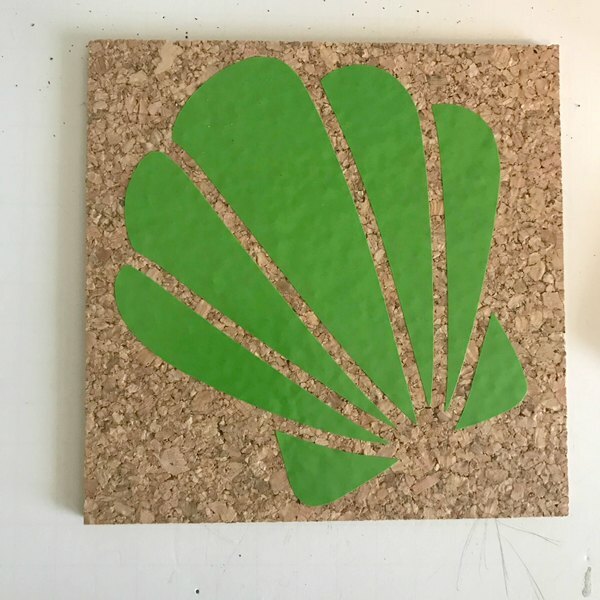 When I was thinking about using my wood burning tool, I thought of the trivets. That’s what prompted my Pinterest search for ideas. For the trivet, I used two of them glued together because they are quite thin. 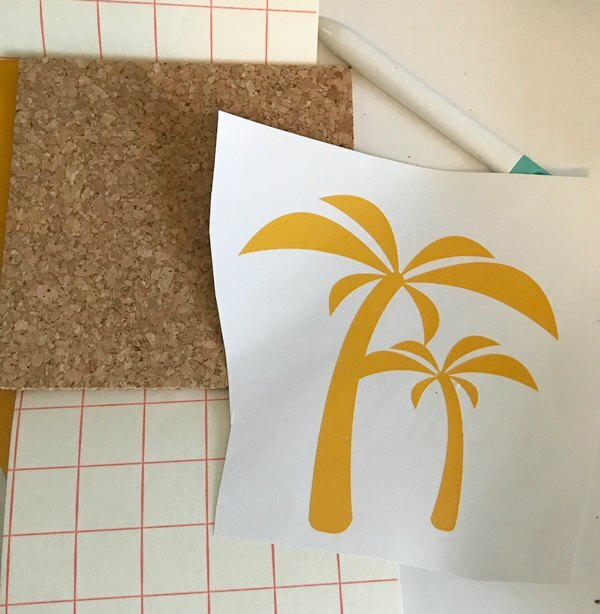 I added a coastal design to both of them using Design Space for my Cricut. After cutting and weeding, and using transfer paper, I placed the designs on two trivets and traced them using a pencil. 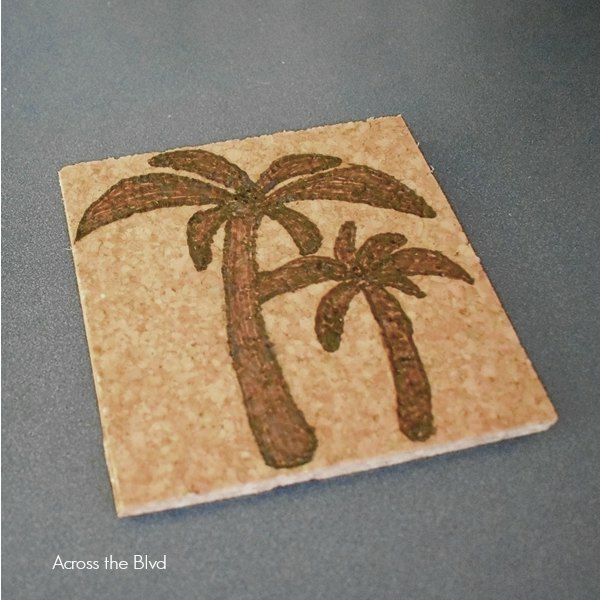 Before using the wood burning tool on the trivets, I practiced using both a small wood piece a small cork coaster. I soon learned that cork is not as easy as wood to work with. There is definitely a learning curve to using the tool even for simple designs like I chose to practice with. 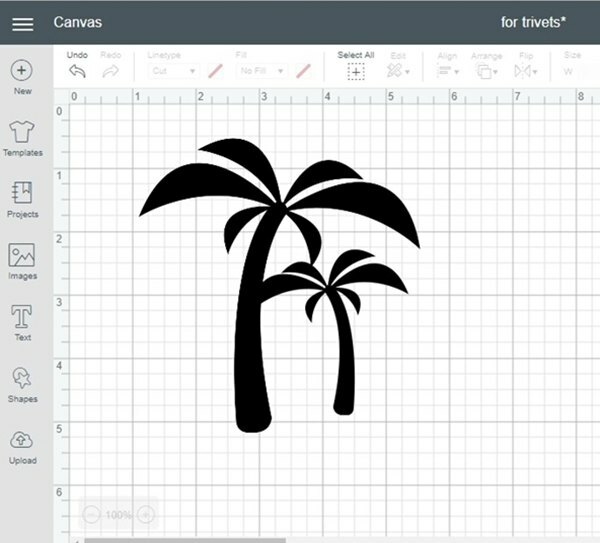 The amount of pressure is key to getting the right look for different spots on the design. 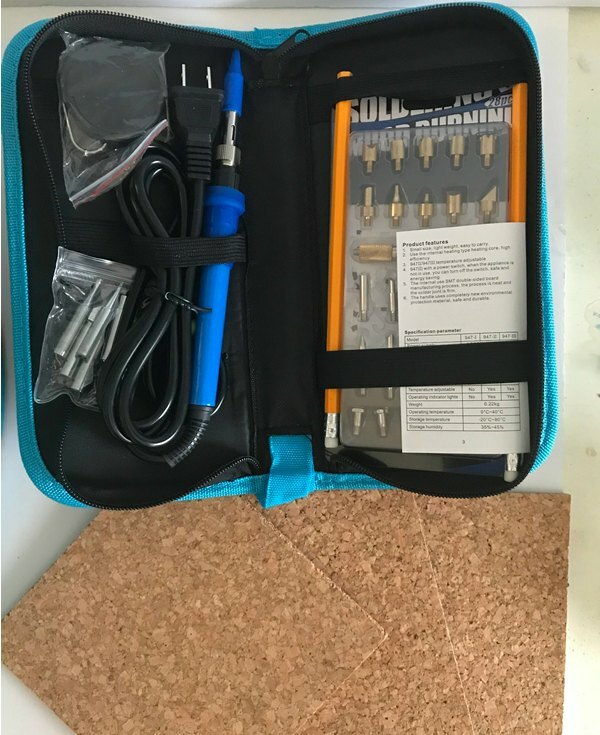 My kit came with an assortment of tips and I tried lots of them. After tracing the designs, I removed the vinyl and got started using the wood burning tool. I went over the outline of the trees first with a fine tip and then filled in the design with a round tip. I think that was one of my errors. I needed to use a different tip for the design. I can’t say that I’m happy with how it turned out. This was definitely user error. 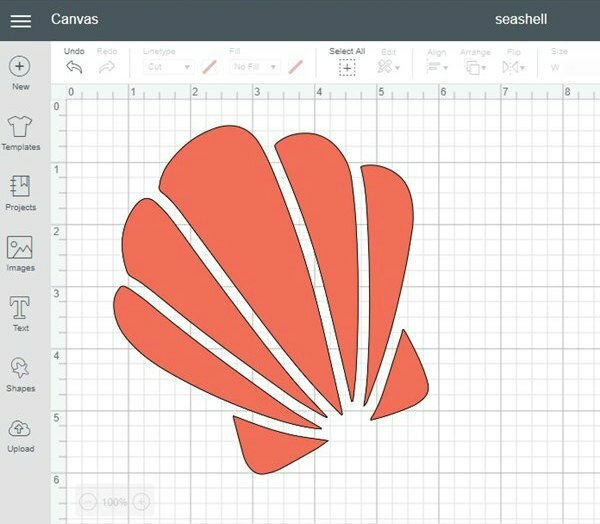 For the sea shell, I tried using two tips, one for the outline and one for shading the rest of the design. As you can see, it didn’t work out too well. Applying the right amount of pressure makes a big difference in how the burn will look. Using the proper tips makes a big difference! Practice. Practice. Practice. Don’t allow the tool to get too hot. Burning cork will become smokey quickly. Use low temperature settings. I was frustrated while trying to complete these. I’m not a perfectionist, but I do like for projects to be visually appealing. This trivet doesn’t make the cut for being something that I’d want to have out on my counter top, but that doesn’t mean I’m giving up! I feel that practicing more with the tool would have been beneficial. I’m going to call this Pinterest Challenge a semi-fail. It’s not terrible, but it’s certainly not great either. It’s tricky and there is definitely a learning curve involved. I hope with more practice, my project will turn out better. When I use mine for a while, it gets so hot I can’t hold it. Maybe its because mine was only $12. I’ve read that some of them can get way too hot too quickly. I didn’t have that problem with this one, thankfully. Be erly, I really appreciated your candid assessment of the project and helpful tips (the not cursing one applies to all projects I think LOL!). I want to try a couple of new craft project skills this year, but I may pass on wood burning if someone as talented as you struggled with it. I wouldn’t pass on it, Debbee. I think it will be fun to work with once I get the hang of it. I guess I didn’t expect the learning curve to be quite as wide as it is. I also think I’m going to stick with wood projects instead of cork for a while. I am sorry your project didn’t work out as planned. I like your tips, Especially cursing doesn’t help. I thought I might want to try wood burning but maybe I will postpone it. Thanks, Debra. I’d give it a try. It just takes more practice than I anticipated. Plus, I think wood will be easier than cork to work with. Maybe it’s the pictures but I think they look pretty good! We have only used our wood burning tool a few times and I do find I hard to make lines that are consistent in their depth and color. I do enjoy using it but have learned that sometimes I just have to embrace the less than perfect-ness of the project. Thanks, Joanne! I did choose pictures that made it look not quite so bad! I may have to do that as well and accept the less than perfect project! My ex used to own one and did quite a bit of nice projects on wood. Maybe wood would be a better starting project?! I think it does take quite a bit of practice though. Yes, I learned that wood is easier to work with than cork. It does seem that it will take a lot of practice to become more proficient with the tool. I appreciate your honest assessment of your struggles. That being said, I’m sure you’ll figure out how to make the craft work for you! I’m looking forward to seeing new projects. I hope I will. It’s on my to do list to keep trying! Snap – I had a wood burning tool for my birthday last year too! I’ve used mien a few times and love it but don’t think I’m very good! I never even thought to try it on cork, now I’m excited by the possibilities. I honestly think yours are much better than you think, and I love your handy tip about cursing. Funny that isn’t it? You think it’s going to help but it really doesn’t, except to make you momentarily feel better! Thanks, Julie! Yeah, it if did help, I would have been less frustrated! I think practicing will help a lot though. I’m looking forward to more practice. 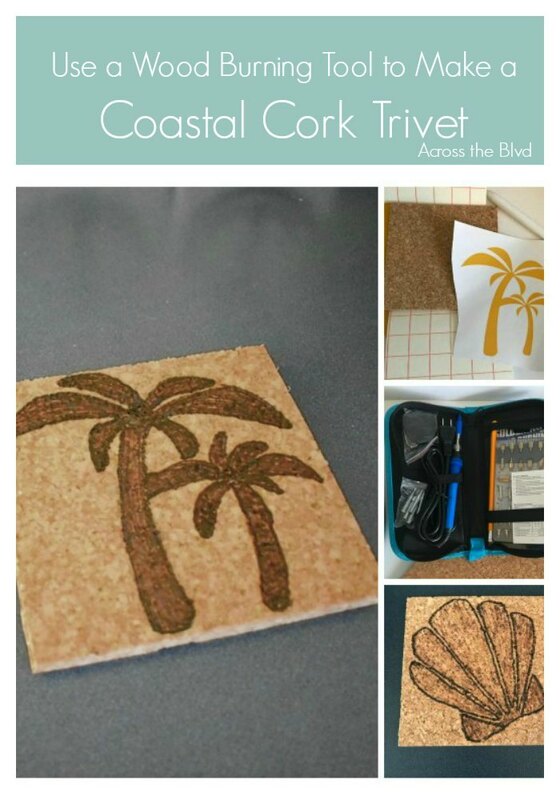 I’ve seen lots of great cork projects and I’m determined to get better at it! Whaaaaat? Cursing doesn’t help? Just Kidding. Beverly, I think it’s great that you’ve pushed through and that you are sharing your tips. I only used my wood burning pen on wood before and even then I had problems. One Tip I’d like to add is: Patience! I was always to fast with the wood pen. When I would give the heat time to scorch into the wood, my lines were more even and the color deeper. I know, right? 🙂 Patience is always a good idea when trying something new. Oh Beverly, I quite understand your frustration. We do seem to be our worst CRITIQUES. I think they are adorable and work perfectly in a coastal home. How fun that you have pieces that you created and are not cookie cutter trivets! That’s true! We do usually give ourselves the most grief over how something we’ve made looks. Thank you, Kelli! Who would have thought that cork would be more difficult than wood? I have a wood burning tool, but haven’t really used it yet. These tips will come in handy. Pinned. I didn’t think cork would be that difficult to work with. I’m sure that it was more in the technique I used than anything else, since I’ve seen so many nice looking cork projects. I’ll keep practicing to see if I can get the hang of it. Thanks for pinning.